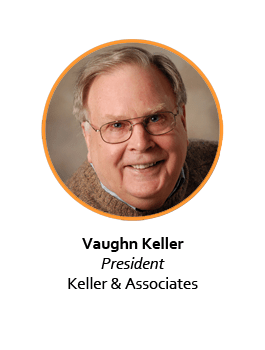 Understanding and promoting change –institutional, organizational, individual – has been the organizing theme of Vaughn Keller’s career. He has worked in health care, social change, and communications as a leader, clinician, and consultant. His graduate studies have led to degrees in systems theory, administration and policy studies, marriage and family therapy, and the creation of development programs for professionals. Dr. Keller has been the Director of the Health Behavior Laboratory at the University of Miami-Humana Health Services Research Center, Associate Director of the Bayer Institute for Health Care Communication, on the faculties of the University of Miami and Yale Schools of Medicine, Director of Management and Organization Development at the Planned Parenthood Federation of America, a senior consultant with Educational Systems and Designs and coordinator of curriculum and development at the Community Development Foundation. For several years he practiced marriage and family therapy. He conducts research on education and communication in the health care setting and is a frequent contributor to journals and professional conferences. Current projects include advisory positions to three start-up companies, conducting research on the diffusion of innovation, and executive coaching.